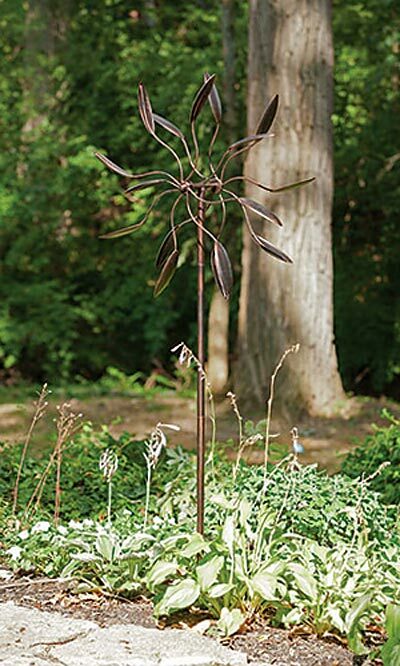 Add a sculptural element to your landscaping with the Panacea Dual Leaf Kinetic Art Windmill. The 22.5" diameter, dual toppers, straight shaft, and bronze finish will surely bring drama and style to your yard in moments. Eight arms on each topper radiate from a center hub, and each culminate in a rounded leaf shape. The curve on each rod and slightly cupped design of the metal leaves brings added style to this item, and this shape helps capture the wind to spin the topper. The light brown hints throughout the bronze colored unit capture sunlight for a lovely shine, and the metal construction adds durability. Insert the 11" long, step-in base into your soil, for a stable display, and be sure to situate the item where it will remain visible and easily move in the wind. Elevate the natural style in your garden with this Dual Leaf Kinetic Art Windmill. Assembly required.